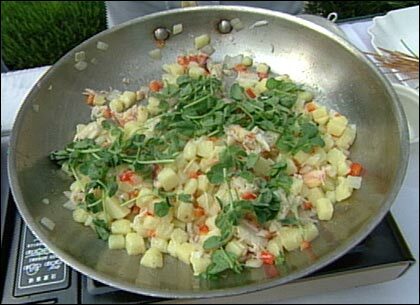 In a sauté pan reduce the white wine, shallots and lemon thyme sprigs on medium heat. Remove the shallots and thyme towards the end. Slowly whisk in the 150 grams of butter. Stir in the chopped lemon thyme. Season with salt and pepper. In a sauté pan heat up 2 tablespoons of olive oil and 20 grams of butter. Add the diced onion, stirring until it is transparent. Next add the potato, bell pepper, crab meat, and sweet pea tips and cook until the potatoes are golden. Season with salt and pepper. Turn the heat to low and keep warm. In another sauté pan heat up the remaining olive oil and 10 grams of butter on high heat. Season the scallops with salt and pepper and sear them on both sides. On warm plates, lightly press the potatoes into a 3-inch ring to form a circle. 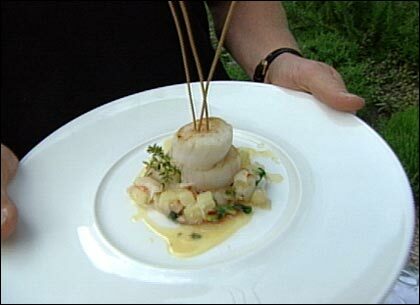 Place 2 scallops on top and garnish with a sprig of lemon thyme and drizzle with the butter sauce. This segment appears in show #2812.